Coat of Arms in window at the back of the church. Browse: Home ∼ Coat of Arms in window at the back of the church. Coat of Arms of Sydney William Herbert Pierrepont, 3rd Earl Manvers (1825–1900). This is in a window at the back of the Church. 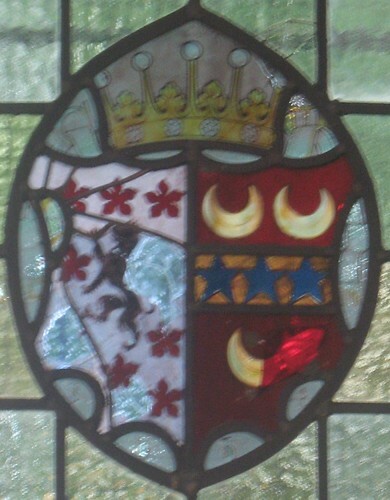 The left hand side (dexter) of the crest is the Pierrepoint Family coat of arms and the right hand side (sinister) will be that of his wife, Georgine Jane Elizabeth Fanny de Franquetot, second daughter of Gustave, Duc de Coigny. The 3rd Earl Manvers became Lord of the Manor in 1860 on the death of his father. There was significant rebuilding of the church in the second half of the 19th century when a balcony was taken out and the north aisle was rebuilt.